Fujitsu Laboratories Ltd. is setting up a new research and development centre in Toronto to create the next breakthroughs in quantum-inspired computing as part of a new partnership with the University of Toronto. This marks the first R&D centre opened in Canada by Fujitsu Labs, a major engine of research and development in the world’s leading innovation clusters such as Silicon Valley, London and Shanghai. A separate, independent centre for research collaboration will also be established at U of T, led by Ali Sheikholeslami, a professor in the Edward S. Rogers Sr. Department of Electrical & Computer Engineering. Fujitsu Labs is the latest tech multinational to locate in Toronto, drawn by the city’s burgeoning global innovation reputation in artificial intelligence and health care – growth areas that have happened because of ongoing cutting-edge research conducted at U of T and its nine affiliated hospitals. “We feel there is great importance in strengthening our ties with the University of Toronto, whose exceptionally talented people have achieved preeminent results in research not only in the field of computing but also health care, finance and other fields,” he said. 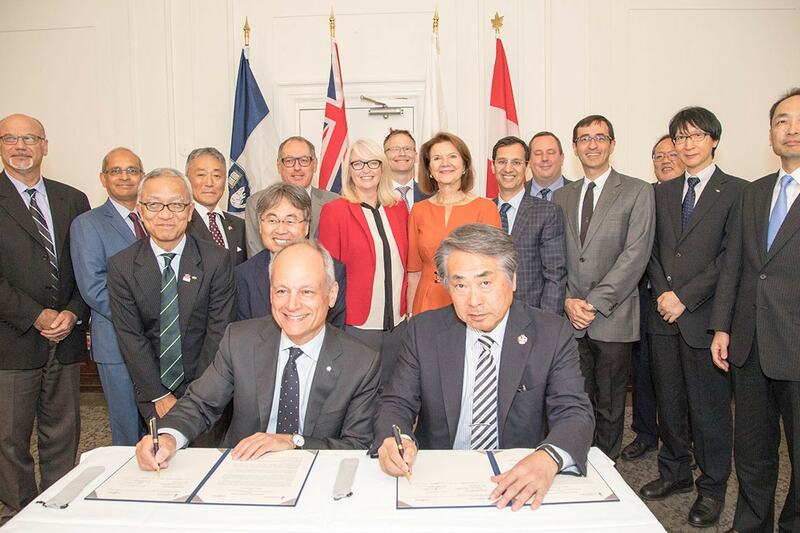 Guests from all three levels of government including Toronto Mayor John Tory were on hand at the signing, which fell into place after the president and Ted Sargent, U of T’s vice-president of international, visited the company in Tokyo last fall. To date, the relationship between U of T and Fujitsu Labs has led to 10 patents, the publication of more than 30 joint research papers and $7.5 million in direct funding and in-kind contributions for research. And it all started with a six-week internship by Sheikholeslami at the company’s headquarters in 1998, where he was finally able to complete the modelling work he researched while a PhD student at U of T.
Sheikholeslami and his long-time collaborator at Fujitsu Labs, Hirotaka Tamura, have worked on advances in non-volatile memory technology (used in contactless smart cards), high-speed signalling and the creation of the world’s first digital annealer – an important leap forward in quantum-inspired computing. The company plans to work with U of T to “accelerate the practical use of quantum computing technologies” that can reach beyond the limitations of today’s supercomputers to tackle complex global challenges that involve massive amounts of data and various elements that complicate calculations. Interest in quantum computing and how to find a way to apply it in business is why U of T’s Creative Destruction Lab launched a new quantum machine learning stream for startups earlier this month. The roughly 25 startups involved in the program have access to the world’s only commercially available quantum computers, also known as quantum annealers, built by Vancouver’s D-Wave Systems. To date, only a handful of U.S.-based organizations have had the tens of millions needed to invest in D-Wave’s bleeding edge technology. They include Google, Lockheed Martin and the Los Alamos National Laboratory. Sheikholeslami said he’s interested in speaking with CDL to see how they, too, can be involved in this stream. He and Fujitsu Labs are also interested in working with U of T’s globally renowned machine learning experts to use their technology to speed up their AI algorithms. What is a digital annealer and how does it work? Annealing, a term borrowed from material science, means to find an optimum solution, i.e. one with the least “energy.” In the quantum world, this means finding the best needle in a pile of millions and even billions of bits of information – and doing it quickly. D-Wave’s quantum annealer technology uses superconductors and requires precise and bulky refrigeration to keep the units at the optimum temperature of 15 millidegrees Kelvin. Another less powerful option are simulated annealers, which use software. The digital annealer created by U of T and Fujitsu Labs is a middle ground of sorts between these two approaches. The digital annealer can also slide into a regular PC – just like a graphics card – and supercharge its ability to crunch hugely complex optimization problems in a fraction of the usual time and for a much cheaper cost. And no refrigeration is required. One of the first places he sees the digital annealer being used is in hospitals. In the case of radiation therapy for cancer patients, the digital annealer created by U of T and Fujitsu Labs will help health-care professionals more precisely calibrate the dosage and angle of beam radiation needed to “create maximum damage” to shrink tumours and kill cancer cells with little to no damage to surrounding healthy tissue, Sheikholeslami said. But to arrive at the best treatment, which needs to be tailored to each individual patient, requires sorting through an estimated 100,000 bits of information to find the optimization point. The number of possibilities you have with 1,000 bits of unknown information is 21000. That means the number of possible solutions is approximately a single digit with 300 zeroes in front of it – that’s how big it is, he explained. It also has profound implications for banking by enabling financial experts the ability to quickly optimize their portfolios. The ability to have a direct and positive impact on people’s lives is quite exciting for Sheikholeslami and his team of fellow researchers. “Initially our work was quite hidden, deep inside your cellphones or your Presto card and you wouldn’t be able to see it. Now it’s coming to a point where it’s more visible – like something in a hospital” that can have a profound and positive impact on someone’s life, he said.